So, how did I end up strolling through the blazing sun at Monte Bello Open Space Preserve after I told everybody yesterday I was hitting the redwoods at Pescadero Creek County Park? Two things, both motivated by greed: 1) Pescadero Creek was closed for “red flag danger” (it’s open again today) and I wasn’t interested in getting fined for hiking in a park that’s been closed for safety reasons; and 2) I’ve had this crazy idea brewing in my brain to write a column about a counterintuitive summer hike … one where you embrace the sun rather than avoid it. 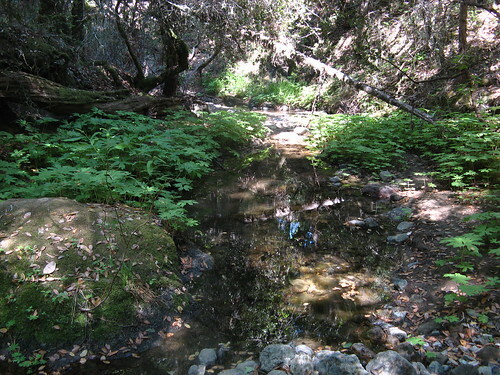 The notion would dwell in the mental boonies where it belonged so long as nice sane hikes like Pescadero Creek were available for scouting. Just about anyplace else on earth, you’d be screwed, but in this neck of the woods there are so damn many parks and trails that you feel a bit like Robin Williams in that scene from “Moscow on the Hudson” where the profusion of coffee choices knocks him out cold. Slather on a gallon of sun screen. Wear comfy clothes that cover but breathe so they don’t make you hotter. Walk really slowly when climbing hills to avoid overheating. Fine, but is Monte Bello really worth all that? Yeah. Really, I’m not just trying to talk myself into it. 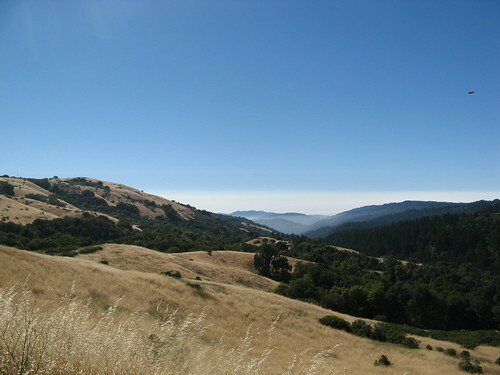 The view of Stevens Creek Canyon from near the parking lot: it’s one of the best in the Santa Cruz Mountains because it’s right on the edge of the oak woodlands/chapparal to the east and the conifer forest to the west. The green/gold contrast is most striking when the hills have the shimmering vibe of early summer, before the late-season brown-out kicks in. There is a seductive beauty here that entices you to hike right out into it regardless of the weather. 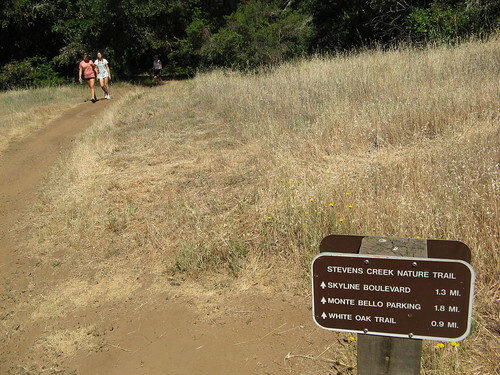 But from here you can also hike down into the pleasant shade of the Stevens Creek Nature Trail. I believe this is an elegant brodeia (some think it’s an Ithuriel’s spear, but a couple others back me up on this one) Quite a few were growing on the nature trail. Most of these oak woodland areas are lovely to walk in, but a nightmare to photograph, especially on sunny days, which overexpose every unshaded pixel of the picture. 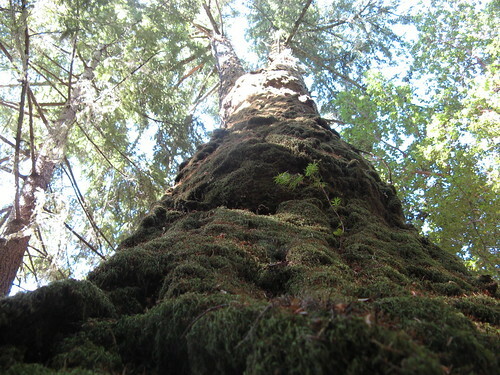 This must be a Douglas-fir. It has an odd split in it. (When all else fails in the forest, shoot upward). Here’s the end of the Nature Trail. Some guy was dragging his family out on a hike that his kids were complaining about every step of the way (I take it he only gets away with such outings on Father’s Day). I swear, I took this picture myself and didn’t steal it from Dan Mitchell. 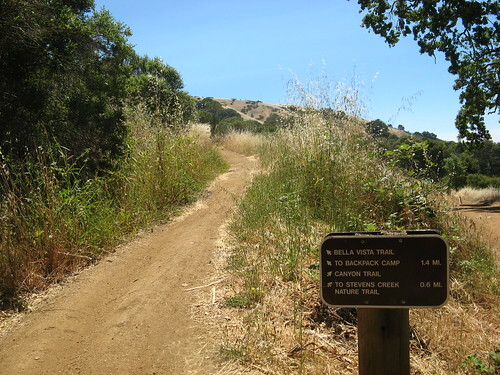 Bella Vista Trail is the must-hike route. It’s a single-track up to the backpacking camp. Somewhat steep, downright arduous in the open sun, not much shade (but enough oases to pause a few times on the way up). The view of Stevens Canyon is gorgeous the whole way, but gorgeous in away your eyes can appreciate but camera lenses really can’t capture. (Another of those “why we hike” things). Black Mountain, elevation 2800 feet, is where I almost always end up. One of my favorite places in the Santa Cruz Mountains, and not only because of these cool rocks. Saw a bunch of pink flowers like these. I’m assuming it’s a kind of poppy (Farewell to Spring is what the flower watchers call it). So, those are the highlights. As always, feel free to add your comments. Tom, I believe what you called an elegant brodeia is “Ithuriel’s spear”. 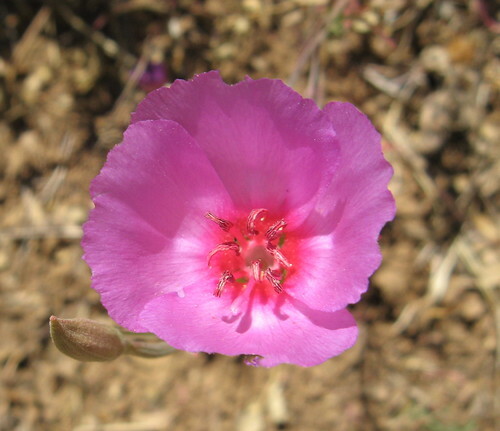 That pink flower looks to be “Farewell to Spring”, a Clarkia species which is common around these parts late May through June. Great photos, both! Great post & great scenic hike. Relieved to see you caught a picture of ‘the tree’. It seems like everyone who hikes this route captures a shot of the same anonymous tree. Funston named in the ‘Fabulous Tree’ in his flickr posting … http://www.flickr.com/photos/uptownswell/434227980 and I think it’s deserving of the title. 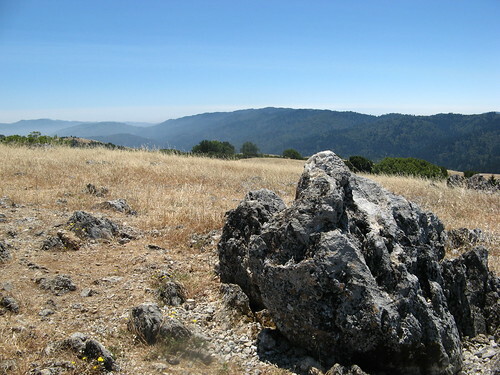 Monte Bello and Los Trancos was my first hike with the Black Mountain Group of the Sierra Club. Been hiking a lot with them. I love the shot with Mount Umunhum and Loma Prieta in the distance. I have a similar shot. Have to admit, I did minimal sun hiking this past weekend. Point Reyes and Purisima Creek Redwoods. Hoping to hike Little Basin tomorrow-ah the life of a teacher. I concur with winehiker, the blue flower is Ithuriel’s Spear aka Wally Basket. I think the pink flower is a Ruby Chalice Clarkia. Good ‘un, matey! I have yet to gambol in and amongst them thar hills! One of these days . . . Your little camera is doing a great job. The color on the flowers is awsome! PS – I’ll be hiking Half Dome #22 this Friday – I have 18 Friends and Family joining me – you done it yet?? Tom, I think you’ve got it right. 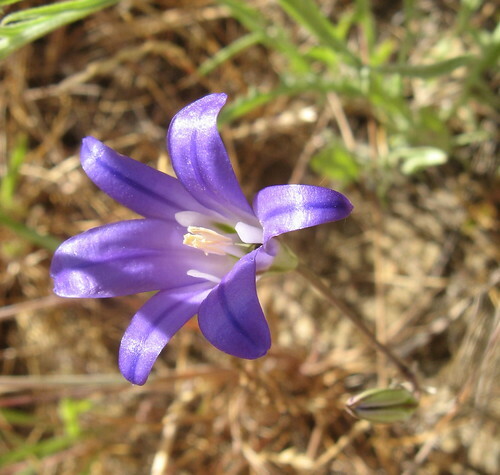 Your photo from Monte Bello is Elegant Bordiaea. I must disagree – you had the flower right the first time as Elegant Brodiaea. Ithuriel’s Spear is closely related, but has 6 free sepals, while Elegant Brodiaea has 3 free sepals and 3 “bladed” ones, which your photo illustrates well. Search on “Brodiaea elegans” for the Elegant Brodiaea and “Triteleia laxa” for Ithuriel’s Spear on the excellent CalPhotos wildflower database, and the difference should be fairly clear. The two species threw me off for some time, as they do look quite similar, and grow in the same habitats. Another differentiator – Elegant Brodiaea grows mostly as single flowers on a stalk, while Ithuriel’s Spear has a stem that branches to form a loose cluster of flowers. Yet another reason to get out of the warmth of our little valley here in sunny Livermore. I’m putting it on my “must do” list now. Black Mountain is fantastic. Monte Bello open space is a goody. Some folks I met once lived in a commune there somewhere down the Canyon Trail, on “The Land,” when it was privately owned, in the late ’60s and ’70s. 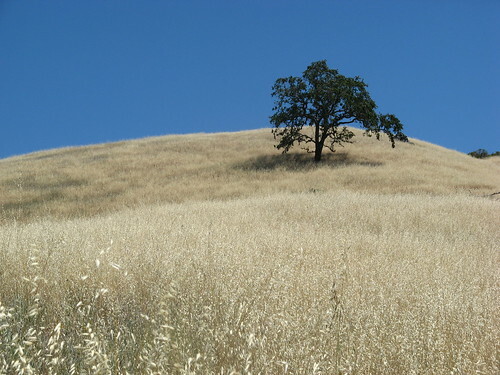 Windy Hill, Long Ridge, all wonderful.